The First Lady of the United States has recently taken to her official Instagram account to post a very special photo of herself inside the Notre Dame Cathedral. On Monday, April 15, 2019, Melania Trump said that she was heartbroken for the people in Paris, France, following the devastating fire that destroyed the historical church. In the picture shared with her millions of fans and followers, the First Lady can be seen lighting up a candle inside the gothic landmark, along with the message that she was praying for everyone's safety. The beautiful church, one of the most beautiful and famous buildings in history, was engulfed in flames on Monday afternoon, shocking the locals and tourists in the vicinity. But Melania wasn't the only one who paid tribute to the cathedral. Former First Lady of the United States Michelle Obama also used Instagram to share a beautiful memory of hers. "I will never forget the first time I walked into the Notre Dame Cathedral. I was a teenager on a school trip to Paris. It was my very first international trip, and until then, I hadn’t seen much outside of the South Side neighborhood I grew up in. " According to Michelle, the cathedral took her breath away, not only for its history, but also its artistry and spirituality. The 55-year-old described it as a "place that lifts you to a higher understanding of who we are and who we can be." The picture she posted, however, was taken during a visit with her husband, and former U.S President. Barack Obama and daughters Malia and Natasha Obama. 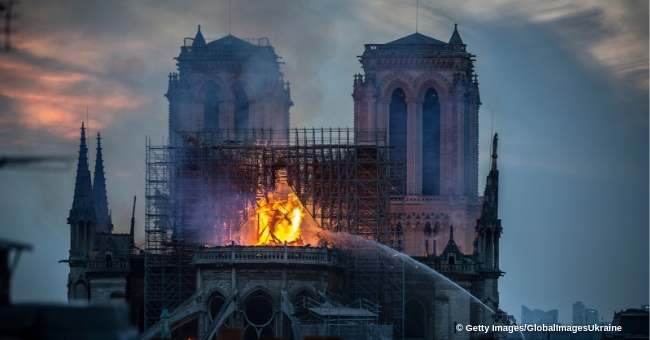 The fire caused a considerable amount of damage, leading the spire and part of the roof to collapse, but, fortunately, Emmanuelle Macron, the French President, guaranteed that it will be rebuilt. Salma Hayek's husband, François-Henri Pinault, was quick to announce that he and his father, François Pinault, would offer $113 million to help with renovations. Pinault, the CEO of Kering, an international luxury group that owns Gucci, Alexander McQueen and Saint Lauren, will be using the money from their family's holding company, Artemis.